This is an incredible last chance sale for the Fall – Winter 2008 Catalog. (Christmas Sale Flier) Sale continues through Jan 31st! Boost those December sales! During the month of December, Designers can earn up to $291.50 in new product including a pack of 2009 Spring Catalogs. 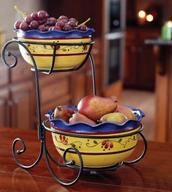 You can earn the NEW Venetian Home Bean Pot and a pack of 2009 Spring Catalogs by selling $1,000 in contest sales. The next two levels are $1,500 in contest sales and $2,500 in contest sales. Click here to see the unbelievable amount of NEW product you can earn in December! Click here for the flier in Spanish. 15-Dec All Spring 2009 Catalog product goes on sale. First day to order Spring/Summer Fundraising products. 24-Dec The warehouse will be closed (and will not ship orders) from December 24 – December 31 due to year end inventory. The office will be closed Thursday, December 25; Friday, December 26 and Thursday, January 1. The warehouse will resume shipping orders on Friday, January 2. 26-Dec Faxed or mailed in orders and applications must be received by midnight central time to count for Dec.
During the month of January, Hostesses who hold a $200 qualified Party may purchase a set of 2 Serving Bowls (6 patterns to choose from), the Double Serving Bowls Metal Stand and a BLT Dip Mix for $9.75. The retail value of this Super “Bowls” package is $74 - $93. This is the perfect entertaining piece for parties and family gatherings! Designers who enter three $200 qualified Parties will earn a Spring 2009 Supply Pack. This is step 1 to a three step Designer promotion. Designers who complete all three steps will receive a bonus product pack with all exclusive Celebrating Home products. Step 2 will take place in February, and Step 3 will take place in March. Click here for more details. 26-Jan Faxed or mailed in orders and applications must be received by midnight central time to count for Jan.
31-Jan Last day to order Fall/Winter fundraising products, last day to order Fall/Winter Booking Gifts. After a busy holiday, invite friends & family out of winter hibernation to shop for “all you didn’t get for Christmas” treats out of our 2009 catalog. Enhancements include. . .
* SIMPLY SUMMER fun pieces back by popular demand (now with a spreader for dips!) and so much more! It’s a SUPER ‘BOWL’ January for YOU! With $400 in sales receive a FREE 24 oz soy candle of your choice. All you need to do right away is. . .